USA Climbing’s new CEO Marc Norman talks a future training facility, Olympic qualification pathways, and getting psyched for Tokyo 2020. Margo Hayes during finals at the 2018 Bouldering Open National Championship. Photo: Greg Mionske Photography. USA Climbing has a big couple of years ahead of it, and they’ve set the tone of things to come by announcing a move of their headquarters from Boulder, Colorado to Salt Lake City, Utah. 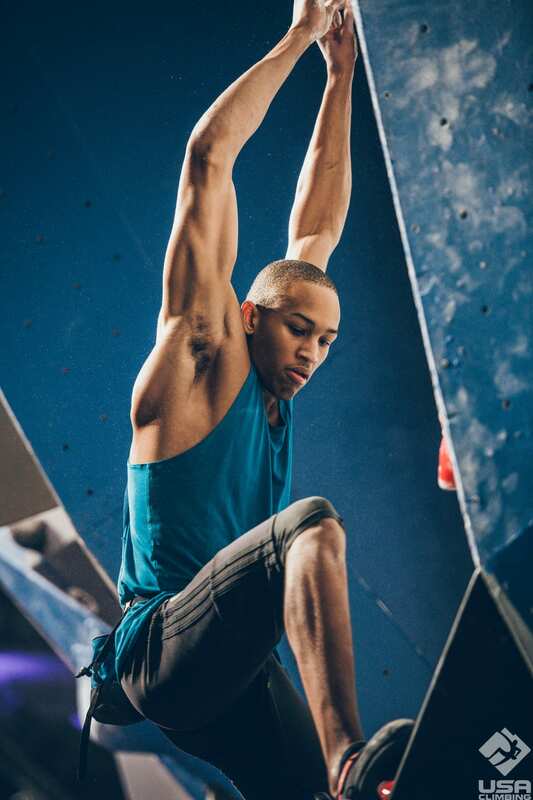 Kai Lightner during qualifications at the 2018 Bouldering Open Nationals. Photo: Greg Mionske Photography. Under the leadership of CEO Marc Norman, who has been at the helm since late July 2018, USA Climbing is maneuvering in multiple ways to try and position American athletes in strong positions heading into the Olympics in Tokyo, Japan come 2020. There are plans for a new training center and a couple of exciting new competition events on the horizon. The two newly announced events are the Combined Invitational, to be held January 18 to 20, 2019, at Momentum Indoor Climbing, Utah, and the 2020 Pan-American Olympic Qualifying Event, to be held February 27 to March 1, 2020, at Sender One, California. We caught up with Marc Norman to hear about these new developments and events and what’s in store as things start moving fast in the lead up to Tokyo! There are plans to create a National Training Center in Salt Lake City, correct? What will that look like? We’re not short on aspirations, that’s for sure, and a training center is one of them. I used to be a competitive speed skating athlete. I competed in the 1992 and 1994 Olympic trials, and since then have worked in sports at a high level for 20 years. One key thing I’ve taken away is that high performance sports have specific needs, so coming to USA Climbing it was quickly apparent to me that there was a big difference between competition setting and commercial setting. 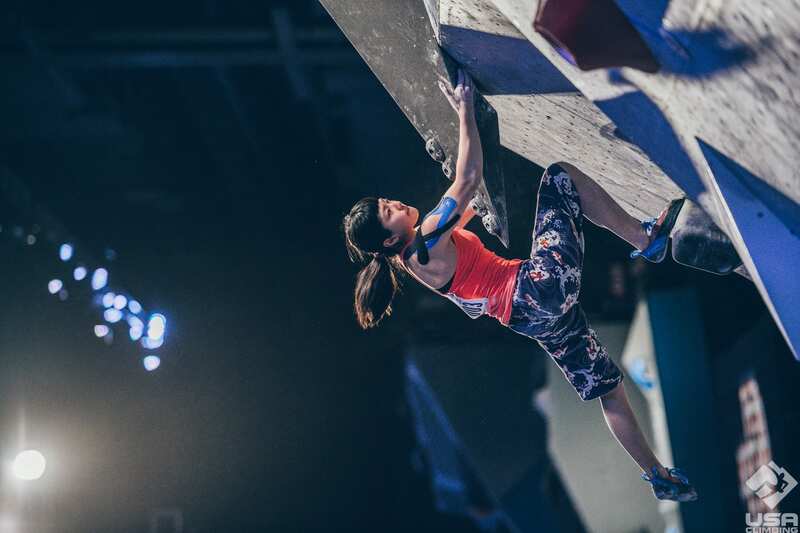 Ashima Shiraishi during finals at the 2018 Bouldering Open National Championship. Photo: Greg Mionske Photography. We need a place where our athletes can experience competition setting on a regular basis. And that will never replace the commercial gyms, but we need a place where they can train day in and day out. Ideally we’ll have a competition speed wall set up all the time. Athletes could train all the time. Competition bouldering and lead set ups of course too. It wouldn’t be open to the public and would be largely driven just by our national team athletes. We may need a fundraising campaign to get there, but it’s on the horizon as we try to build a more high-performance team and put in place more high performance services. What is the atmosphere as climbing gears up for the Olympics? This is the sport’s debut on the world stage, so there must be excitement, anticipation, but also nerves and some anxiety, right? I think what’s challenging for the athletes and for us is that the sport is moving fast. The International Federation, who we look to for guidance, is also just crafting things. A perfect example: the combined event. The first time it was held in adult competition was just a few months ago at Innsbruck—that’s not normal! Normally an Olympic discipline has been held in a certain format at least for some number of years! Expectations are changing everyday as we learn more. The athletes are also anxious—they want to know how many and which opporutities the’ll have to qualify for the Games, that sort of thing. But very exciting, for sure. Our first team selection event is only two months away. USA Climbing also just announced two new events. Can you tell us about the Combined Invitational and the the 2020 Pan-American Olympic Qualification Event? The Combined Invitational will be the first event of our 2019 Team USA selection. A critical event for sure. One of the first things I noticed coming on board at USA Climbing was, “Wow, we’re competing in this combined event in the Olympic Games, but we don’t do it at all in our home country.” So we started creating the guidelines about how to stage a competition and select our team through it, and that’s what this is. The 2020 Pan-American Olympic Qualification Event will be at Sender One. If the U.S. hasn’t qualified our full quota of athletes [maximum two women and two men], we’ll have one more chance then, and being able to have that event on our soil, getting that home-field advantage boost, will hopefully help us qualify for those last spots if we still need to. For more information on how Olympic qualifying will work, check outQualification Pathways to the 2020 Olympic Games at USA Climbing.